I've been a big blog slacker as of late. Part of it is lack of good ideas to write about, and the other part is that this past week has been stressful. I'm not sure that I can think of a time that was more stressful that this past week. I won't go into the details, but things are looking up now, and I couldn't be more grateful for that. I have found that when I am stressed though, my dogs are always there to cheer me up. I know this might sound strange if you aren't a dog person, but these two babies are little clowns. They always seem to just know when I need some cheering up, and they always manage to make me laugh. I've introduced my babies before, but it's been awhile, so I'll introduce them again. First is Batman, our 3 year old French Bulldog. We've had him since he was a puppy, and he has moved across the country and back with us. He's my first dog, and I he has convinced me that dogs are awesome! Then we have Daphne. 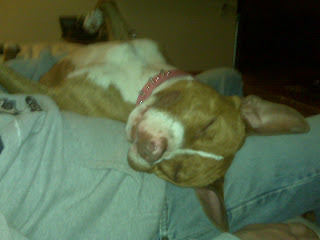 She is a two year old American Staffordshire terrier that we rescued (or maybe it's the other way around?) . We got her in February from the West Los Angeles Animal Shelter. She is the happiest and most eager to please dog that I have ever met. I must say, even when times are tough, I am a very lucky lady.